Never give human pain medications to your pets! Home » Never give human pain medications to your pets! Today’s Pet Poison Prevention Week article is about human pain medications…and why you should NEVER give them to your pets! Over-the-counter anti-inflammatory medications like Aleve (naproxen), Advil (ibuprofen), Aspirin (ASA), and Tylenol (acetaminophen) can be deadly if given to your cat or dog. Pets should never be given a human pain medication because their system processes it very differently and the dosage is too strong for them, which causes toxicities very easily. If an anti-inflammatory medication is ingested by a pet it can cause irritation or ulcers in the stomach. The absorbed medication is then processed through the liver, sometimes multiples times, causing more damage each time. It is also processed through the kidneys, potentially causing kidney damage. Cats in particular cannot process many of these human anti-inflammatory medications and are much more susceptible to severe reactions. 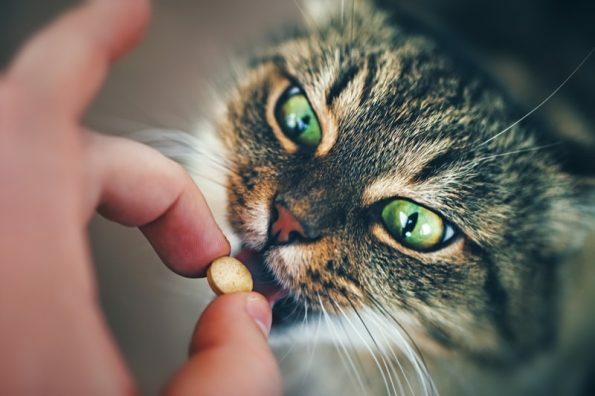 Cats have less of the enzyme required to process acetaminophen and other anti-inflammatories, and as a result they can easily build up to toxic or deadly levels in the cat’s system. Symptoms can range from nausea, vomiting, diarrhea, abdominal pain, and lack of appetite, to increased drinking and urination, stumbling, depression, seizures, and comas. In both cats and dogs, acetaminophen can cause severe and irreversible liver damage. In cats, it can also cause anemia, and a blood transfusion may be needed. Many other human medications are also toxic to pets, so please handle and store all medications carefully and away from pets – even a single dropped pill can look like a new treat and be toxic to your pet! If your pet ingests human medication of ANY type, the first thing to do is call your veterinarian (or your nearest emergency clinic if it is after hours), and tell them what you think your pet ate, and how much, so they can advise you on next steps. If it is within 1-2 hours the medication may still be in your pet’s stomach and not fully absorbed, so your veterinarian may be able to induce vomiting immediately to remove the bulk of the medication. However, depending on the medication and time of ingestion, blood work and further treatment may be required.